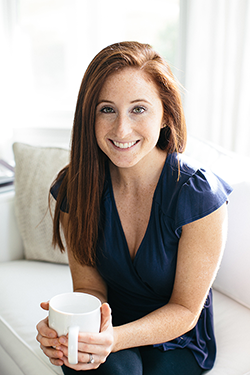 I’m Amy, and I’m a Nutritional Therapy Practitioner (NTP) who helps active men and women, athletes, and women with a history of disordered eating heal their frustrating digestive issues and rediscover their energy through real food and ditching restrictive diets. Nutritional Therapy emphasizes a foundational approach to wellness, focusing on addressing root-cause issues to restore health by way of nutrient-dense, properly prepared, whole foods and lifestyle changes. A few years ago I was eating a primarily plant-based diet and fixated on everything that I put into my body. Meanwhile I was also overtraining (hello marathon and endurance exercise obsession! ), all the while under a tremendous amount of daily stress with work, my commute, planning a wedding, buying a house, looking for a new job, and more. Eventually, the amount on my plate and my unhealthy habits took their toll on my health. I was bloated constantly, experienced acid reflux, was tired all time, and didn’t feel anything like myself. Needing answers, I started with GI doctors, who basically told me I was healthy and that nothing was wrong with me, or slapped me with the diagnosis of IBS and told me this would just have to be something I had to deal with. I wasn’t willing to accept that as my future, so I took my health into my own hands. Seeking out what was at the root of my digestive, hormonal, and energy woes, I found a functional medicine practice that helped me understand what was going on, what was to blame, and how to heal holistically using the right nutrients my body needed in the form of food and supplements. It was this experience that led me to enroll in the Nutritional Therapy Association’s Nutritional Therapy Practitioner program, and now I get to help other women who are struggling with frustrating digestive issues and hormone imbalances find health and vitality again by addressing the root causes rather than bandaid-ing symptoms, and using real-food nutrition to heal. Crave snacks throughout the day, especially sweets in the afternoon. ...Then Nutritional Therapy is right for you!